Welcome to the first episode of the HempCast Podcast. Our goal is to educate the public about the differences between Hemp and Marijuana. Both plants come from the Cannabis family with very different effects on the mind and body. 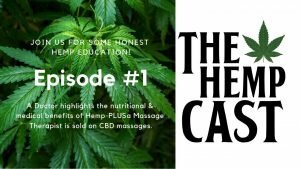 A Doctor highlights the nutritional and medical benefits of Hemp-plus a Massage Therapist is sold on CBD massages.